It’s no secret that boxing can stir up the most unlikeliest of plots both in and outside of the ring. 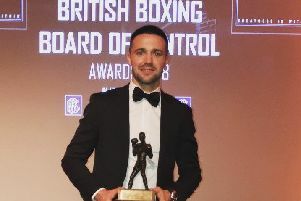 The preparations that Edinburgh light-heavyweight John McCallum will undertake ahead of his next fight in November falls right into that category. There was a time when McCallum and former professional footballer and English boxing champion, Leon McKenzie, couldn’t bear to be in the same room as one another. 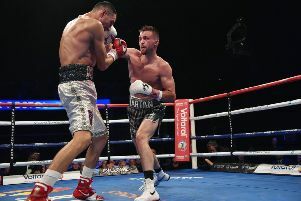 The build-up to their contest at London’s York Hall in October 2015 – a bout that saw McKenzie triumph after six rounds – produced more than just a few insults thrown between the pair. However, time is a great healer and McCallum is now ready to let McKenzie help him become a boxing champion. The 30-year-old former Leith Victoria amateur will enter the knock-out competition Ultimate Boxxer at London’s O2 Indigo on Friday, November 2. Eight fighters will compete in a three, three-minute rounds format for their share of £50,000 prize money and golden robe. “It’s true that Leon is going to be walking me into the ring and will be in my corner too,” McCallum said of former Norwich and Crystal Palace striker joining his team. “It’s a strange one and not anyone could have predicted but it’s been three years since there was that real bad blood between us. “Leon started sending me private messages on Twitter when he heard I was going to be in Ultimate Boxxer and then asked for my phone number. I do respect him because he’s a professional athlete and has played professional football at a very high level. He did box at a high level too and became English champion. But he’s now a boxing trainer and he just asked me if he could help me out and I agreed to it. “I’m going to go down to London for a couple of weeks but he’s going to come to Edinburgh too. It’s a two-way thing. I’m still going to be trained by Stevie McGuire up in Glenrothes too. It’s difficult to comprehend McCallum and McKenzie being on the same page given their history. McCallum admits he regrets some of the derogatory remarks he made to his former rival but insists it’s all part of the show. “I knew I had to say stuff like to get under Leon’s skin,” McCallum said of the pre-fight build up three years ago. “I do regret having a go at him about his depression as I never really knew the circumstances behind it all. I thought it was just attention seeking. I’m not from London whereas Leon is famous down there so I had to get people to know what I was about. McCallum had indicated earlier this year he was beginning to bring down the curtain on his boxing career but says he has now had a rethink. “I feel like my career is just getting started. I’ve been frustrated in the past because of the lack of opportunities as you need big fights to give you that motivation,” he said. “I’m also a lot more comfortable at light-heavyweight. I was starving myself trying to make super middleweight and it just wasn’t feasible. “Boxing at the O2 and on Channel 5 in November is going to be a great platform for me.